Christmas with Elizabeth is a film directed by Karel Kachyňa, and written by Jan Procházka. One of about a dozen collaborations that this prolific duo would make during the sixties, including films previously reviewed here, The High Wall (1964), Long Live the Republic (1965), Coach to Vienna (1966), and Night of the Bride (1967). This relatively minor work is a simple story of a delivery truck driver, Hubert (played by Slovak actor Vlado Müller), and the young rebellious girl Alžběta (non professional actress Pavla Kárníková) who is partnered with him as part of a condition of her parole. Somewhat predictably, Hubert is at first cold and unfriendly, none too happy about his routine being messed with, especially by an irresponsible young girl. He disapproves of the way she dresses, the ease in which she interacts with men along their route, and her overall lack of respect to the job. Their interactions are curt and awkward, he refuses to even share a cigarette, but he eventually warms up to her presence, and begins to develop a bond with her. The parts are well acted and convincing, and the pair share strong chemistry. Müller was actually only in his early thirties here, but he easily passes for fifty. Only faint clues are provided as to the background of his character and why he lives a solitary life, however it's easy to understand the man from the strong performance he provides. Kárníková is also impressive, starring here in her only film appearance. I couldn't find any further information about her, but with the naturalness she exhibits, I wouldn't be surprised if she was picked to play a version of herself in this role. The film makes for a pretty good psychological study of two people who would never otherwise cross paths, of the generational conflict, and the unavoidable sexual tension that arises. However the story comes off a bit rushed and choppy at times. Not sure if I can put my finger on an exact reason why, but the scenario just doesn't feel as fully formed as any of the previous efforts by Kachyňa and Procházka I've seen. Still I think it's more than worth a look if you ever happen to come across it. If I happen to come across it, for sure. Otherwise, it just seems like I've seen this general story too many times before. That's a great poster. 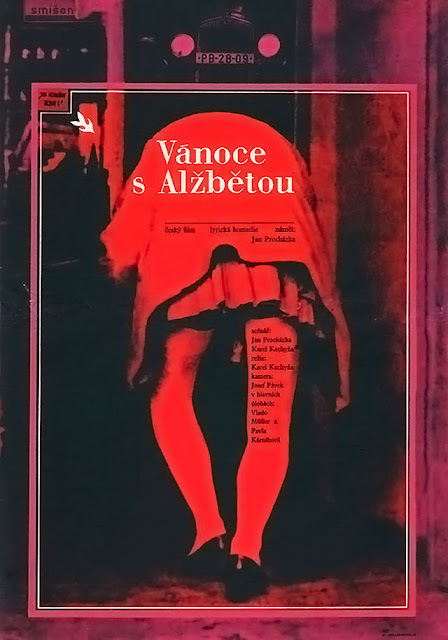 I'm adding it to the list anyway, even if its not one of the most striking of the Czech New Wave. It is a great poster, aren't they all. I also love that image of the bus, truck, and train all arriving at the same time. Kachyna does have a knack for those kinds of shots.